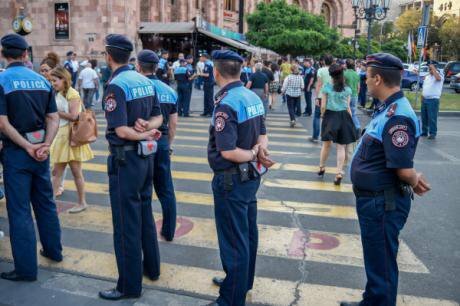 July 2014: police officers block activists from "Stand up, Armenia!" from moving towards Yerevan's Freedom Square. (c) Asatur Yesayants / VisualRIAN. All rights reserved.The Armenians who took to the streets in the country’s largest mass protests in its post-Soviet history last month had many other grievances in addition to Serzh Sargsyan’s attempt to hold onto power. The protesters were concerned about unfair elections, corruption, and the chokehold that oligarchs have on Armenia’s economy. But they were also concerned about a justice system that many see as unfair. Some high-profile incidents have sparked perceptions of politically motivated prosecutions in the country. The new prime minister, Nikol Pashinyan, faces a major challenge in bringing about the changes the public demanded, including in the area of politicised justice. 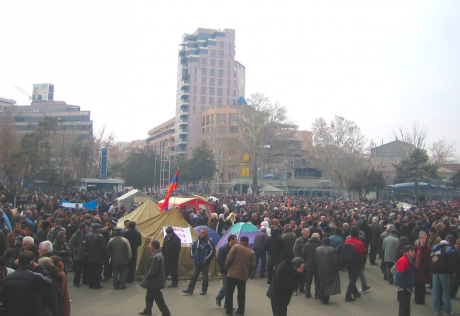 The fifth day of of Armenian presidential election protests in March 2008. CC BY-SA 3.0 Wikipedia. Some rights reserved.A more recent example is the July 2016 protests, sparked by the violent seizure of a Yerevan police station by Sasna Tsrer, aradical opposition group. Public support for them and disaffection with the government grew into almost daily protests in Yerevan. On July 29, police used excessive force to break up the main protest, which was largely peaceful, causing injuries, some serious. This time an investigation did lead to the sacking of the Yerevan police chief and disciplinary measures against 17 officers. 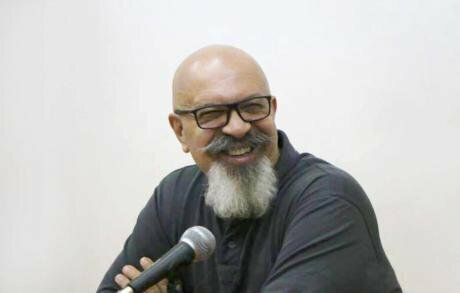 Garo Yegnukian was arrested on 18 July 2018, after giving a TV interview on the Erebuni police station siege. He has been kept in pre-trial detention since. Source: Yegnukian family. 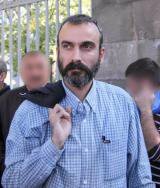 Another example is Garo Yegnukyan, a member of the political group Founding Parliament, who has been behind bars since his arrest in July 2016. The authorities charged him with aiding Sasna Tsrer in taking over the police station, based, apparently, only on several wiretapped phone conversations. The prosecution has stated that Yegnukyan is a flight risk and could interfere with the investigation, but has offered no specific facts or circumstances to substantiate those claims, which should be necessary to maintain Yegnukian’s pretrial detention. Jirayr Sefilyan, the Lebanese-born Karabakh military commander turned Founding Parliament leader. Source: Serouj / Wikipedia. CC BY-SA 3.0. All rights reserved.Just before Safaryan’s prison term was to end in December 2017, which included his time in pretrial detention, the authorities filed new charges against him, this time, for conspiracy — together with Founding Parliament’s leader, Jirair Sefiliyan — to create mass disturbances in April 2015.